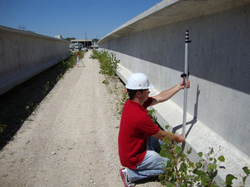 The discrepancies between the designed and measured camber of precast pretensioned concrete beams (PPCBs) observed by the Iowa DOT have created challenges in the field during bridge construction, causing construction delays and additional costs. This study was undertaken to systematically identify the potential sources of discrepancies between the designed and measured camber from release to time of erection and improve the accuracy of camber estimations in order to minimize the associated problems in the field. To successfully accomplish the project objectives, engineering properties, including creep and shrinkage, of three normal concrete and four high-performance concrete mix designs were characterized. In parallel, another task focused on identifying the instantaneous camber and the variables affecting the instantaneous camber and evaluated the corresponding impact of this factor using more than 100 PPCBs. Using a combination of finite element analyses and the time-step method, the long-term camber was estimated for 66 PPCBs, with due consideration given to creep and shrinkage of concrete, changes in support location and prestress force, and the thermal effects. Utilizing the outcomes of the project, suitable long-term camber multipliers were developed that account for the time-dependent behavior, including the thermal effects. It is shown that by using the recommended practice for the camber measurements together with the proposed multipliers, the accuracy of camber prediction will be greatly improved. 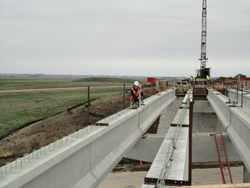 Consequently, it is expected that future bridge projects in Iowa can minimize construction challenges resulting from large discrepancies between the designed and actual camber of PPCBs during construction.